Have you ever wondered how to get that really gooey and soft flapjack? Well I did! After several attempts I think I've nailed it. The joke about these is that the cranberries and oats trick you into thinking the flapjacks are healthy, but read the recipe and you'll see that these are dangerous! I recommend cutting them into small squares! Top tip: Spending a little extra on fruit-filled muesli oats gives tastier flapjacks! 1. Melt the butter in a pan, and add the caster sugar and golden syrup. Heat it until the sugar dissolves, then remove from the heat and stir in the condensed milk, oats and cranberries. 2. Line a baking tray with greaseproof paper. Transfer the mixture into the tray, and press down to just less than an inch in thickness. 3. Place in a preheated oven at 180 degrees Celsius, and bake for 25-30 minutes. 4. Take your flapjacks out of the oven, and crumble the white chocolate on top. The heat from the flapjack will melt the chocolate! Allow it to cool and set before dividing up into small squares. Bizarrely, this recipe came about as a way for me to use up some remaining ingredients in my fridge. Luckily some fresh herbs and a couple of cupboard-must-haves meant I could conjure up something that fitted the mood of a long summer's day, with a bit of sunburn and a rumbling stomach after an active trip to the beach. Top tip: To toast pine nuts I recommend placing them in a dry frying pan over a low heat and keeping them moving. After only a few seconds they'll start to brown and smell delicious. Remove them from the pan immediately, or they'll burn! 1. To make the breadcrumb seasoning, firstly toast and break the bread into breadcrumbs using a blender. Mix in the finely grated lemon zest and the ground nutmeg. Crumble in the dry oxo cube, and add freshly ground pepper to taste. 2. Prepare the chicken next. Remove any excess fat, and using a sharp knife slice the chicken breasts in half horizontally. 3. Smother each of the four chicken pieces in garlic pureé, before coating them with flour, ensuring that any excess flour is tapped off. 4. Whisk the eggs lightly, and dip each floured chicken piece into the whisked eggs followed by rolling them evenly in the breadcrumb seasoning. Place the breaded chicken in the fridge whilst you prepare the risotto. 5. Slice the spring onions into chunks no bigger than 1cm in width. Peel the garlic cloves and crush. Heat the oil in a non-stick pan and add a handful of the onions and all of the garlic to lightly fry them until soft. Keep the greener ends of the onions for later! 6. Add the risotto rice and continue to lightly fry until the rice becomes transparent at the edges. Remove from the heat and add the white wine, enough to just cover the mixture. 7. Return to a low heat and allow the mixture to simmer and reduce. Gradually add in the chicken stock bit by bit, allowing to reduce in between additions. Whilst cooking the risotto roughly chop the coriander and parsley. 8. Meanwhile toast the pine nuts in a dry pan (see my top tip above!). When the rice is done (this can take 30 minutes or more - keep tasting it to know exactly when) remove from the heat. Add the coriander, parsley, lemon juice, remaining onions and pine nuts to the risotto and stir in. 9. Set the risotto aside and heat 3 tbsp of olive oil in a shallow frying pan. Lightly shallow fry each breaded chicken piece over a medium heat, turning them over regularly until cooked through. 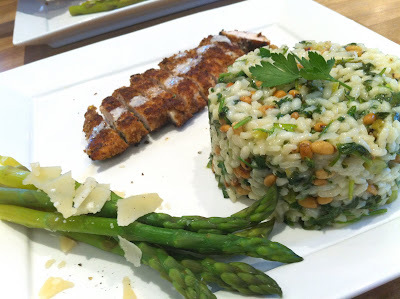 Serve the chicken sliced next to or on top of a scoop of risotto. You can drizzle a little of my Lemon & Garlic Dipping Sauce over the chicken to add extra zing. My Asparagus & Parmesan Shavings side dish and a gin & tonic also go well with this! As one of my favourite vegetables, asparagus can be amazing on it's own. However I've found that just this small addition of some crumbled parmesan makes this side dish worthy of being a stand-alone starter! This is not really a recipe, more of a hint! Top tip: British asparagus season is from April-June. To ensure you use only the fresh stem of the asparagus, use your hands to bend the stalk and break off the ends at the weakest point, discarding the sometimes woody ends. 1. Break the asparagus stalks at the weak point using your hands, and place in a pan of boiling, lightly salted water. A handy tip is to use a pan that is smaller in diameter than the length of the asparagus - so the bottom of the stalk is underwater and the heads are resting out of the water. This enables boiling of the stalks and steaming of the tender heads. 2. To check if the asparagus is done (roughly 3 minutes), I use a fork to bend the asparagus towards the side of the pan. If they just start to bend, then they are ready! Drain them and plate them quickly. 3. Shave the parmesan block into large flat chunks, and crumble over the top of the asparagus. Serve with a knob of salted butter, either as a starter, or as a side dish to any fresh summer recipe (e.g my Breaded Chicken with Toasted Pine Nut & Coriander Risotto). With my new-found love of prawns and summer drawing near, this dish came about as a light and fresh way to share a meal over a glass of white wine. It takes minutes to cook, so you don't have to sweat in a hot kitchen! Top tip: You can play around with this one a little, and make it to your taste - you can add parsley, even take out the chilli, and use as little or as much garlic as you want. 1. Chop the spring onions up to 1cm thick. Peel the garlic. De-seed the green chilli, and dice it finely. Chop the chives roughly too. 2. Using all but a handful, sauté the spring onions in the butter with crushed garlic until the onions soften. Add the prawns and chilli, and heat through for a minute. Then remove from the heat before you add in the wine. 3. At this point, put the fresh egg tagliatelle in a pan of boiling water, with a little salt. 4. Return the prawns and white wine to the heat and reduce the mixture by approximately half. Crumble half of the chicken oxo cube into the pan, and stir in until it dissolves. Season the mixture with pepper to taste. 5. Remove from the heat and stir in the creme fraiche. Add all but a handful of the chopped chives, and juice of half the lemon and stir in. 6. Drain the tagliatelle once it's cooked, and add the mixture to the pasta. Serve with the remaining chives and spring onions sprinkled on top, and a slice of lemon. You can also add some garlic bread to the plate, if your guests are hungry! I'm quite dominating in the kitchen and therefore I find it quite good giving my sous-chefs little jobs to do to keep them entertained and out of my way. My boyfriend excelled on this one, so I'm allowing him to post his recipe. Top tip: This can be made with or without the cheddar, and used as side with meat, or as the topping for a hearty cottage pie. Milk - between 100-500mls, depending on texture required. 1. Boil a large pan of water, and meanwhile peel and cube the potatoes. 2. Boil the potatoes for at least 20 minutes, or until soft enough to poke right through with a knife. Drain the potatoes, and begin to mash with a metal potato masher. 3. Little by little, add in some milk whilst mashing. You are aiming for a good consistency, not too runny. Don't add all the milk at the same time! 4. Add in the butter, and finely grated cheddar. Stir in one teaspoon of mustard. 5. Continue mashing until the cheese has melted. Taste, and add more mustard if required. Season with black pepper and salt. 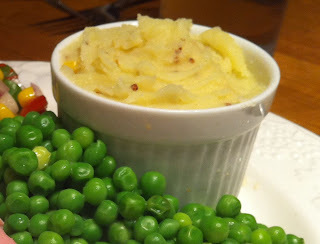 Serve hot with a small knob of butter on top, with my Lamb Cutlets, or use as the topping for a cottage pie. 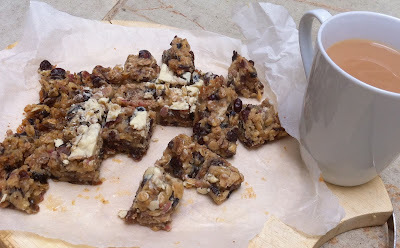 I first made these to bring to a picnic at Glyndebourne Opera, and these were the first of the snacks to disappear. They're easy to make, and can be served at room temperature. I made these cupcake size for the picnic, but they can easily be made larger for a stand-alone starter. 1. To prepare the pastry cases, use a pastry cutter to cut the rolled out pastry into circles. Obvously, choose the cutter to match the size of your pastry dishes! Grease each dish with butter, and lay the pastry inside. Weigh down the pastry with baking beans (see my Top Tip above). Place in the oven at 180 degrees Celsius for 10-12 minutes, until the pastry casings are lightly golden. 2. Whilst the pastry is cooking, peel and slice the red onions, and halve the cherry tomatoes. Peel the garlic too. 3. Heat some oil in a non-stick frying pan, and at a low heat add the red onions, cherry tomatoes, crushed garlic and thyme. Quickly stir in the balsamic vinegar and sugar, and allow to the tomatoes and onion to soften and caramelise. When it's all ready, place some of the mix into each pastry case. Next crumble on some goat's cheese - this isn't an exact science, use as much or as little as you want! 4. 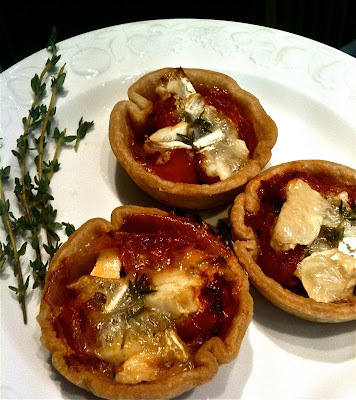 Place the tartlets back in the oven at 180 again, until the cheese is slightly browned on top. Serve each tartlet with sprig of thyme for decoration, either warm on a bed of rocket as a starter, or store in a sealed container to bring on picnics. This recipe evolved from a basic steamed pudding recipe that I decided to turn into something completely lethal on the taste-buds! 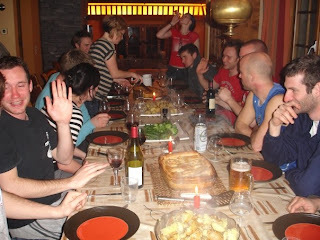 It's simple if you have a good steamer, and is a killer end to a dinner party. The long cooking time allows a starter and main course to be prepared in the process. Top tip: A stand alone steamer is perfect for this pudding, as it leaves room on the stove for cooking other dishes at the same time. 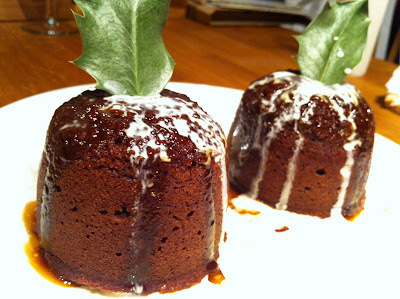 You can also add some double cream to the toffee sauce just prior to serving, for some extra gluttony! Serves 4-8, depending on how much room your guests have left in their pudding compartment! 1. Grease your chosen pudding bowl with butter. 2. Melt the butter, brown sugar and golden syrup in a pan, over a low heat, until the sugar has dissolved. 3. Pour a small amount of the sauce into the pudding bowl, roughly 2-3cm deep. Leave to one side to cool. 4. Grab a large mixing bowl, and whisk together the sugar and butter (until it becomes light in colour). Then slowly beat in the eggs, bit by bit, then drop in the vanilla essence. Continue beating until it's all mixed in thoroughly. 5. To prepare the cocoa, add the boiling water to the cocoa powder and stir. This should reach a 'just-runny' consistency. 6. Whisk the cocoa into the mix. 7. Sieve the self-raising flour, and then gradually fold it into the pudding mix. The best way is to use a large metal spoon, constantly turning the mixture over, ensuring the air is kept in the mix. Don't whisk it! 8. Add the pudding mix to the pudding bowl so it sits on top of the toffee sauce, and cover the mix with a disc of grease-proof paper, and on top of this, cover the bowl with foil, securing around the edge with a piece of string. 9. Steam for one and a half hours. Tip upside down to serve! Serve in a bowl, with the remaining re-heated toffee sauce (and double cream if you like!) and a scoop of vanilla ice-cream. You may notice that from my recipes on this blog that I'm not a big fish-eater, however not wanting to limit my taste-buds I like to include prawns in some of my favourite recipes. 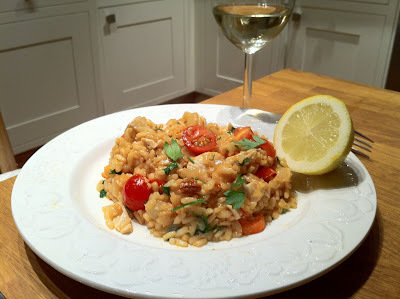 This paella is again very simple, great for a crowd and guarantees full stomachs. Top tip: Make a large batch, as this can be kept in the fridge allowing the flavours to infuse, making leftovers even tastier than the original! 1. Remove excess fat from the chicken breasts, then dice the chicken into 2cm chunks. Cube the chorizo into 1cm pieces (don't use sliced chorizo - it's not as good!). 2. Core and slice the peppers into strips, and dice up the onion, and remove the garlic skins from your garlic cloves. 3. Heat the oil in a non-stick wok pan (if you have a paella pan - perfect! ), and stir fry the chicken until cooked through. Remove the chicken from the pan, and set to one side. 4. Add the diced onion to the remaining oil, and cook until softened. Now add the chorizo cubes, crushed garlic, and the paprika. Fry for 2-3 minutes. Now add the strips of peppers, and fry for another 2 minutes. 5. Add the Arborio rice to the mixture, and stir fry until the kernels seem a little transparent. 6. Lower the heat, and add the white wine to cover the rice, with just enough liquid to see it bubbling through. At this point you can add the saffron strands. Let simmer until the liquid reduces out of sight. 7. Add some chicken stock to cover the rice, and reduce down again. Don't add all of the stock at once, this is a very slow process of watching the stock reduce, and then adding more to create the correct consistency in the rice. (If you run out of stock, and the required consistency hasn't quite been reached keep adding boiled water). At this point you can add the cooked prawns and chicken. 8. Whilst reducing the mixture, and creating the correct consistency, keep tasting the dish - but also add chili, salt & pepper to flavour. 9. The last step is to add in halved cherry tomatoes to heat through, and then the handfuls of chopped parsley. Finally squeeze the lemon juice all over and stir through. Serve in a bowl, with a slice of lemon on the side, and a glass of chilled white wine! This pie is perfect for those cold winter evenings with family or friends. I made a huge version whilst skiing in Meribel for a group of 12, and they still talk about it to this day! The recipe is simple, scalable, and can be made in advance - ready to chuck in the oven when stomachs start rumbling! Top tip: If you like garlic, you can add a little - but don't over-garlic this one! 1. Grab your chicken breasts and remove any excess fat. Dice the chicken into chunks, about 2cm big. On a plate, dust the chicken in ground nutmeg - so that the meat looks speckled, but not covered. 2. Take out the core and seeds from the green pepper with a sharp knife, and slice the green pepper into strips from top to bottom. Cut the strips in half. Slice the button mushrooms to your preferred taste. 3. Warm the olive oil in a non-stick frying pan, and then add the dusted and diced chicken. Stir fry until the chicken is just cooked through, then add the sliced green pepper and mushrooms. Continue stir frying for another minute. 4. Add the tin of condensed mushroom soup (add salt and pepper to season to taste), and allow it to simmer while you start rolling out the puff pastry. 5. Dust your cooking surface and rolling pin with a little plain flour. Cut the pastry into two halves (one for the top, one for the bottom of the pie) and roll out the pastry to about 1/2cm thickness. Make sure the halves cover the size of your pie tin! Grease the pie tin by rubbing a little butter all over the insides, and lay your pastry bottom in the tin. At this point there should be some excess pastry overhanging the edges of the pie tin. 6. Allow your chicken/mushroom mixture to cool slightly before you pour the filling into the pie tin. Lay the pastry top over the mixture, and seal the edges by pressing around them with a fork. Carefully cut the excess pastry from the edges, and these can be used as decoration by cutting them into leaf shapes and placing neatly on top of the pie. Make two cuts in the top of the pie with a knife to let the steam out while cooking. 7. Put the whole tin into a pre-heated oven at 200 degrees Celsius, and cook for about 20-45 minutes. You'll know it's done when the pastry is nicely browned on top! Serve with new potatoes, green beans, or broccoli.